Read why we were voted 1 of Melbourne’s Best Cooking Schools and what the Weekly Review said when they dined with us. 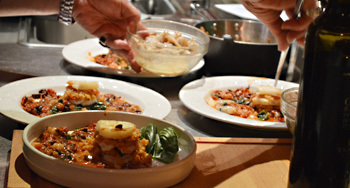 Authentic Regional Italian Cooking Classes in Melbourne set to make your cooking and dining experience much more spectacular! Let us put together a class for your next special occasion, corporate or team social event – in our home or in yours. Can’t decide which class to Gift for your family member or friend? Don’t worry! Purchase a Gift Voucher and let them choose themselves! Meet Sandra, and read her and husband Alf’s travel adventures, keep up to date on latest events and enjoy the wonderful recipes shared. Welcome to La Cucina Di Sandra! If you love food, cooking and Italian Culture, then La Cucina Di Sandra has the Melbourne Food Experience to excite you! This is more than a cooking school, it’s a cooking and eating experience that brings people together and fosters a passion for Italian Food. La Cucina di Sandra is all about rejoicing in the everyday and learning the art of eating and enjoying life the Italian way. This means celebrating life around a convivial table, sharing original Italian food made with simple but quality ingredients. When you leave my classes you will feel enriched and confident to cook these dishes yourselves. Enticing traditional Italian recipes and authentic Italian cooking, you’ll be back for seconds! Sandra, thank you for hosting my Hens night dinner. Thank you so very much for the wonderful class and delicious dinner! I had a fantastic time and so did my guests. They were talking about it for days! You were a wonderful, entertaining, patient and informative hostess and teacher. I can’t wait to try the recipes at home and I hope to be able to attend another one of your classes sometime in the future. Great concept- and very enjoyable way to learn some of those special secrets behind Sandra’s impressive cooking skills. The stand out dish from last night’s “frutti di mare” test class was definitely the calamari- although the mussel & white bean soup plus the tiramisu were equally good!! Worth attending just to get the recipes! What a fantastic way to spend an evening! I had a great time learning about the food from the northern region of Italy. I had an even better time learning how to make it and eating it! Magnificent, welcoming hosts. Thank you Sandra, loved it! A great night learning about Sardinian cooking and then sharing the wonderful food. Sandra is an engaging and knowledgable host and provides a lovely environment to enjoy the meals she demonstrates. Great tips shared on sourcing good ingredients and good to share in the company of other students/diners. Definitely recommend! Where else in Melbourne can you have the experience of such an intimate chefs table? The classes are run in the stunning warehouse conversion that is Sandra’s home. The beautiful, relaxed atmosphere sets the scene for a night of gastronomic delight. The quality, innovation and fresh approach to lesser known aspects of Italian cuisine has to be experienced to be believed. This truely is a cooking and eating experience like no other! Sandra has devised menus from each region of Italy and on the nights I attended she presented each meal in such a way that it was easy to reproduce at home. I tried one of her Ricotta desserts for a dinner party at home and it was so simple after seeing Sandra prepare it. I could recommend these classes to anyone with even a rudimentary knowledge of cooking, right up to a great home cook. I have done 3 courses with Sandra and each one was FANTASTIC. I have added to my cooking skills and my recipe base. I love the method of learning and having the Cook right there open for questions was a real experience. The food was amazing and well worth the investment. Do it again ? Hell yes I am booked in for the next round. Sign up to receive recipes, latest class schedule and other updates. Thank you Sandra for a lovely evening, with great food, at your beautiful home!